I wish we could’ve taken a picture of the nightingales we heard singing as we rode into Autignac, our first stop in France. It was the most gorgeous, welcoming sound I could’ve wished for and made me feel we were exactly where we were supposed to be. 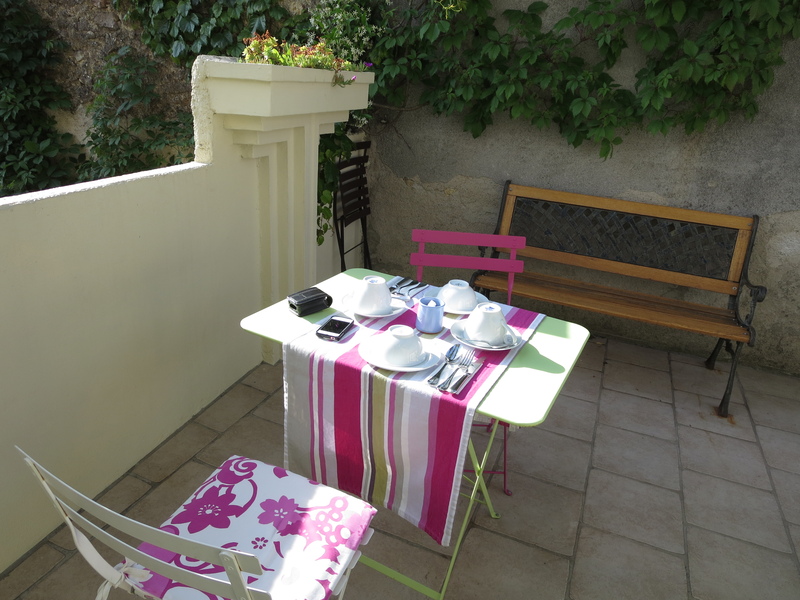 We had stumbled out of the Beziers train station at 8pm in late May of last year after getting up at 5.30am in London, catching the Eurostar to France and then the TGV down to Beziers. I imagine this would be a rare occurrence, but our TGV was late leaving Paris and so we missed our connection in Montpellier to Beziers by local train. 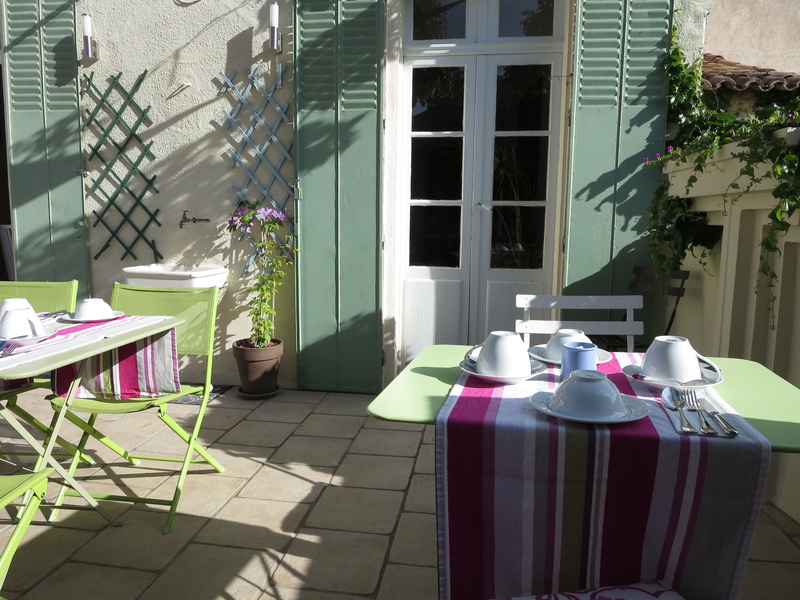 Hence the late arrival, we were already supposed to have arrived at our b&b in Autignac. 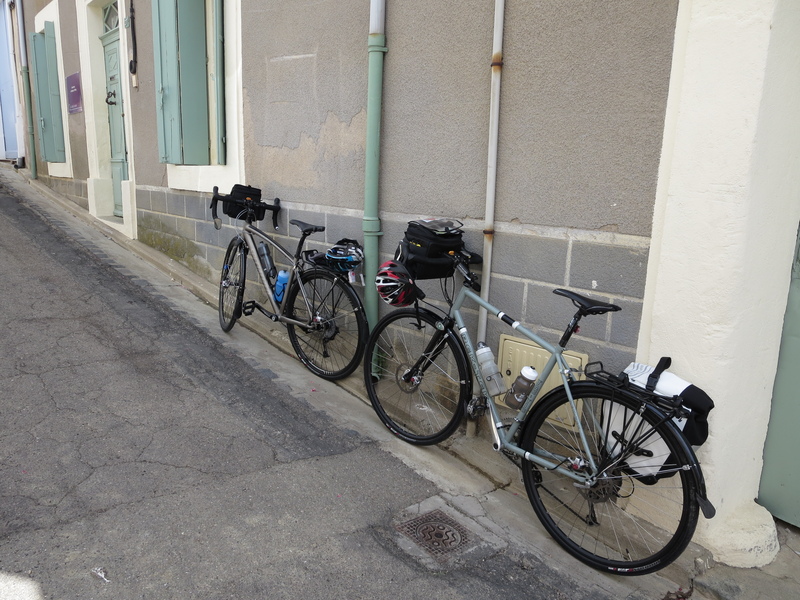 Instead we spent the next hour building up our bikes and repacking our panniers with the bike bags. We had roughly 20kms to ride to Autignac via a scenic route our hosts Darren and Emma had kindly pointed out to us in their emails. A quick hop, but it took a while to get off the bumpy roads of Beziers. My panniers fell off after I failed to avoid a particularly big pothole. We reattached and rejigged them and they never came off again, but it slowed us down for a while. It was a stunning ride to the village though. Once off the main roads we were passed by perhaps one car. The sun was setting, it was warm after the traditional damp of England we had left behind and we rolled past vineyards on narrow country roads, passing through quiet villages. My first introduction to riding in France, pretty sweet. 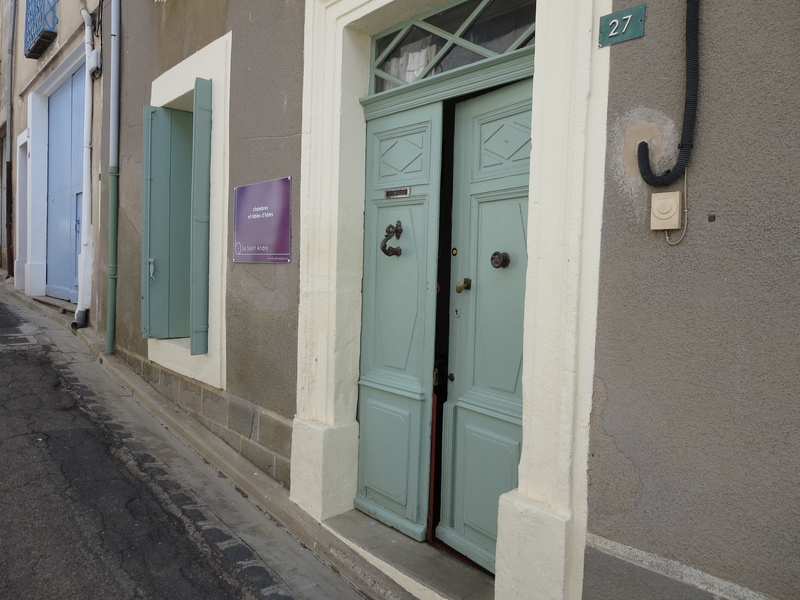 We had to stop at the beginning of the village to listen to the birdsong for a moment, then finally turned into an innocuous road and knocked on the front door of Le Saint André Bed and Breakfast. So welcoming! Darren came out to meet us, showed us where to store our bikes in their spacious garage next door, led us upstairs to our cosy room at the top of the house to dump our bags and then back down to the middle level to have a supper I’d (thank goodness) ordered for our first night. We felt a bit bad, it was already 9.45pm, Emma had had our supper cooked for a while but they were very gracious about it, realizing I think that we’d had a bit of an epic journey. That was my first dinner in France with freshly made cherry clafoutis for dessert, and not my last since it was the height of cherry season. I don’t think I’ve ever seen a set table look so inviting. It’s a clichéd description but lamplight really was glinting off wine glasses, the food was great, there were other convivial guests sitting reading quietly but ready to chat (we probably weren’t making much sense though). When we hit the pillows that night we were out like lights. Really can’t say enough good things about our stay, three nights in a comfortable room, lovely hosts who always helped out with recommending a prime lunch spot, welcome coffee break or a good ride for the day depending on the kms we wanted to undertake. They cater to everyone but cyclists in particular and offer package deals and cycle tours. It’s an unspoilt area to ride. The Languedoc-Roussillon area of France is arguably not the best known of the regions for cycling, but that doesn’t reflect on the quality of the riding terrain. Rolling hills, aromatic pine trees, narrow quiet roads. And the constant birdsong. It wasn’t just the nightingales, swallows were everywhere – swooping and diving through the air, their chatter so loud and pervasive that I laughed out loud as I rode. 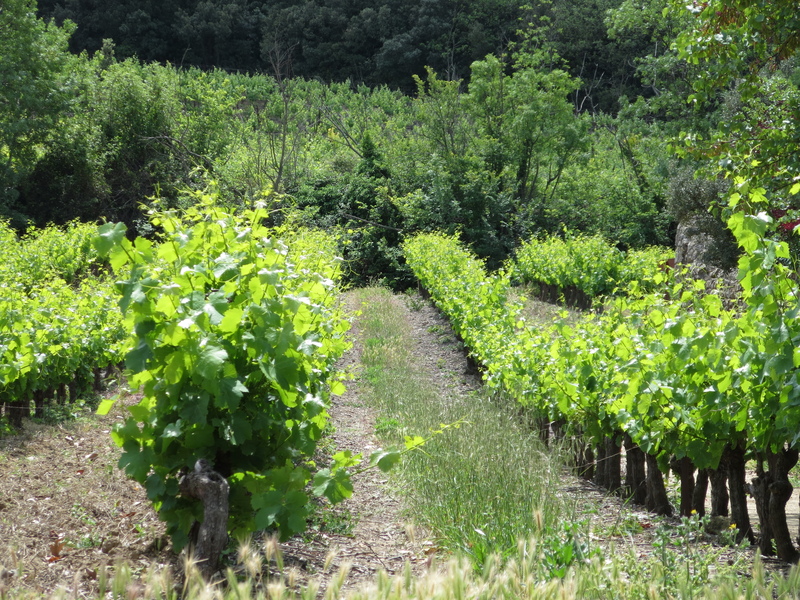 The hills are perfect to stretch your legs on and there are, of course, lots of vineyards to explore. Each night we stayed in Autignac, a very normal working village centred around the wine industry, we wandered around exploring the narrow streets (admittedly this didn’t take long, it’s a small village) and visited the diminutive but eclectic local shop to pick up supplies: bread, cheese, olives and wine. The village is one of seven in the Faugères AOP area where the emphasis seems these days to be on quality organic wine. We loved it there and intend to be back the first chance we get….